Read James Watson’s letter to his son about his newly developed model of DNA. Notice he says that “today you can buy a kit and assemble the structure that Watson and Crick put together.” Well, we’re just going to build our own! James Watson and Francis Crick, plus Rosalind's research partner, Maurice Wilkins, all received Nobel Prizes in Medicine for their work. But Rosalind, by that time, had died of ovarian cancer (likely caused by the X-rays she used to produce her photographic evidence). Her name was not included among those whose work led to the breakthrough, and many have concluded that she was snubbed simply for being a women. 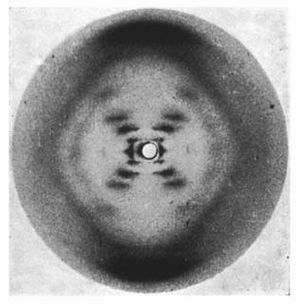 the all-important piece of data that led to conclusion of DNA's double-helix shape. "How Photo 51 Changed the World"
"The Most Important Photo Ever Taken"
What do you think? Share your thoughts in the box below. Was Rosalind Franklin overlooked by history, or even by the scientific community of her day? Or, does the fact that we’re talking about her in our classroom (and that so many people from around the world have made YouTube videos about her) mean that she’s received the fame she deserves? Do you think James Watson, Francis Crick, and Maurice Wilkins intentionally disregarded her role because she was a woman working in a “man’s” field, or was her X-ray crystallography only a small part of a much greater project completed mainly by Watson and Crick? Should her name have been included in the original paper published in the journal Nature (even though she had her own research published in the same issue)? Should she have been recognized by the Nobel committee somehow (even though she had already passed away, and the Nobel Prize is awarded only to living recipients)?